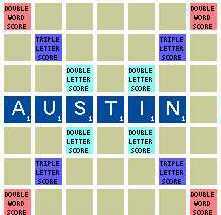 Austin Scrabble Club - Stats"
2019-04-15 Tax Day Meeting 14 21 53 5 15896 378.5 It was a very nice meeting. More Collins players anywhere? 2019-04-08 post-Houston Tournament meeting directed by Matt Canik 14 21 46 2 15472 368.4 Welcome, Dante! And Jean told an enjoyable story about her architect friend. We almost ran out of equipment. 2019-03-25 Pat's Games 10 16 33 2 11621 363.2 Kevin pairings - Director help wanted! 2019-02-25 Pat's Games 17 22 41 7 16133 366.7 Welcome, Shelli! 2019-02-18 Pat's Games 15 15 29 2 10641 354.7 Hello, new people! 2019-02-11 Return to Pat's Games 14 19 46 0 14306 376.5 We are all grateful to the owner of Pat's! 2019-02-04 Dragon's Lair 16 24 46 1 17558 365.8 The setting was fine and we got new people! It was hard to think. Maybe could do again? 2019-01-28 La Madeleine 15 19 45 4 14301 376.3 It went pretty well and the classical music was kind of nice. 2019-01-21 Courtyard Marriott Arboretum Lobby 12 17 45 1 13246 389.6 It was really fun, even though we had to hear Freebird and Bob Seger! 2019-01-14 Meeting of La Mancha 14 16 37 2 12202 381.3 This is our quest! To follow that star!